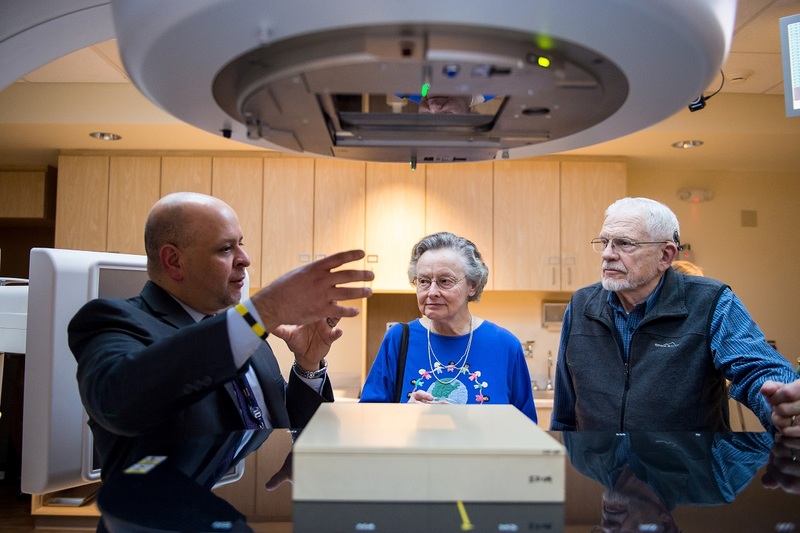 Dr. Navesh Sharma, chief of radiation oncology at Penn State Health St. Joseph Cancer Center, talks to Dr. Elizabeth Edmunds and her husband, Charles Itle, about the TrueBeam technology. The 2,400-square-foot addition includes a state-of-the-art TrueBeam linear accelerator. This technology gives cancer patients fast, more targeted radiation treatment that is more comfortable, more precise and causes fewer side effects than traditional radiation treatments. TrueBeam linear accelerator technology is a powerful combination of 2-D, 3-D and 4-D imaging that is updated every 10 milliseconds, monitors a patient’s breathing and body movement, and allows for faster, more potent doses of radiation directly to a tumor site without damage to surrounding tissue or nearby organs. Cancer physicians at St. Joseph can use this technology to create individualized and more precise treatment plans. Tailored plans and fewer and shorter sessions drastically reduce the treatment time for patients. Penn State Health St. Joseph Cancer Center provides services including genetic education, counseling and testing for people at high cancer risk, minimally invasive internal radiation therapy for liver tumors and cutting-edge clinical trials for new cancer treatments.